All dogs love interactive play, and unique toys are always more fun than average ones. The more popular alternatives include puzzles or pockets to find hidden treats. 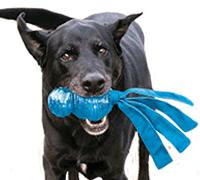 Perfect for bonding, socialization, and mental stimulation, interactive toys keep dogs entertained, and rewarded for a job well done. Rope dog toys are always a favorite for tug-of-war. Along with the tried-and-true standard, we offer ropes with attached balls, plush toys, bones, and KONGs, for the ultimate variety in play. Sometimes there's nothing better than curling up with a soft, cuddly buddy. Our Plush category contains a huge selection of fuzzy friends, in all shapes, sizes, and materials, available with or without squeakers. Because dogs are so easy to please, yours is sure to find a favorite among all the possibilities. We specialize in toys that are made in the USA, so you and your pup can show your patriotic pride.